Visegrad Animation Forum (VAF) has been the largest platform for the animation industry in Central and Eastern Europe. Over the course of its six-year existence, it has managed to build a strong base of film professionals and welcome over 150 participants from all over Europe in Třeboň every year. The Central and Eastern European region operates on very similar historical, artistic and economic fundaments. That’s why it is the organisers’ ambition to broaden the platform by including other countries, increase the range of activities, and umbrella all of that under the new CEE Animation brand. From 6th to 9th May 2019, a traditional pitching competition of animation projects will be held in three categories: short film, series / TV special or feature film. Selected authors will have a unique opportunity to consult projects with invited experts, get valuable feedback and advice on how to improve their presentation, script, or production strategy. Competition participants can secure a chance to find a co-production partner by presenting it in front of more than one hundred film professionals – including producers, TV programmers, festival directors, distributors, investors or representatives of national film funds. They all come to Třeboň to meet new creativity, discuss new visions and opportunities or talk about financing methods and strategies for further development of the field. During those three days, great emphasis is placed on networking in the form of 1: 1 meetings or short presentations of countries and studios. The Forum is organised in collaboration with Anifilm International Festival of Animated Films. Sign up your project by filling in the online form by 13th January 2019 the latest. For detailed rules of the competition, go HERE. 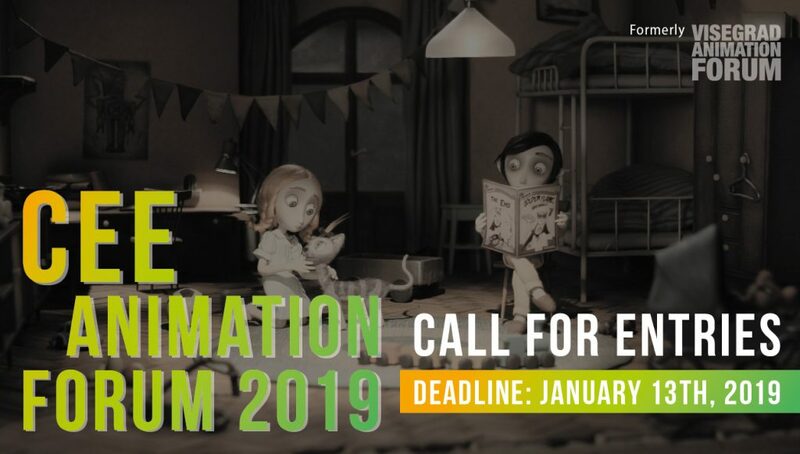 This year CEE Animation is offering a new opportunity to film professionals: a training programme designed to develop projects and create production networks. The goal is to provide participants with training in the field of development, from the work on script to artistic and production counselling. Particular attention will be paid to the conditions of production in the countries of this region. The CEE Animation Workshop is divided into three six-day modules. The first one will focus on development (Ljubljana, December 2018), the second on production and financing (Budapest, March 2019) and the third one on market access. The last module will take place before the CEE Animation Forum in Třeboň. Every year, animation of the Central and Eastern Europe region brings young gifted creators to global cinematography. It is precisely for these debutants that the CEE Animation Talents selection is made each year to promote exceptional short films at leading animation markets, festivals or with foreign producers. This way, successful titles such as Happy End (Jan Saska, CZ), Farewell (Leon Vidmar, SI), Volcano Island (Anna Katalin Lovrity, HU), Cowboyland (Dávid Štumpf, SK) or The Fruits of Clouds (Kateřina Karhánková, CZ) have appeared in the programmes of European festivals in recent years. The joint effort of the CEE Animation platform is to improve the interconnection of Central and Eastern European countries, establish an effective communication network among all players in the animation industry and create suitable conditions for international co-productions. Another piece into the puzzle of success is opening up a discussion with public service televisions and film funds of the region. At present, it’s the public service televisions that do not allow standard co-production of new TV series. The set of measures and the design of the strategy for future years are being prepared within a comprehensive document called “Ljubljana Accord“, a response to the European Animation Plan. Publication of the text is expected at the end of 2019. CEE Animation Forum takes place within the Anifilm International Festival of Animated Films (7th-12th May 2019). CEE Animation is supported from the Creative Europe – MEDIA Programme of the European Union and co-funded by state funds and foundations and professional organisations from the Czech Republic (ASAF, Association of Czech Animation), Hungary (MOME ANIM, Moholy-Nagy University of Art and Design, Budapest), Poland (SPPA, Polish Animation Producers Association), Slovakia (APAF, Slovak Association of Animated Film Producers) and Slovenia (: D’SAF !, Slovenian Animated Film Association).